The T-26E is a gift Rank I Soviet light tank with a battle rating of 1.3 (AB/RB/SB). It was introduced in during the Closed Beta Test for Ground Forces before Update 1.41. An up-armoured version of the T-26, it stands a better chance deflecting enemy shells off its front armour. 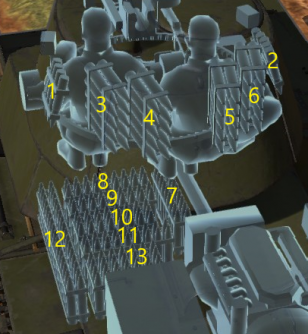 The 30 mm applique armour does not cover the entire area on the hull, so there are exposed areas vulnerable to enemy fire. The main purpose of the tank is diversion. In battle, when a close friendly player is attacked by an enemy, go behind a rock that has the size of the tank's hull, then shoot the target. When it's a Medium tank (like the T-28 ), shoot it's horizontal turret drive (The ring below it's turret), then shoot the tracks, to make it defenseless. In Summary, it is a good tank, it is friendly to new players, but it is not recommended to players above Rank II. Good for gathering SL in low ranks. It's penetration is effective against almost all enemies in Tier I, except the Sturmgeschütz III Ausf. A. A weak spot in the hull box at the driver - keep this away from enemy. Slow for a scout, but agile. Useless in Rank II or higher. The T-26 light tank in Soviet service, while making up a major part of the Soviet armoured forces, proved quite under-armoured when against newer anti-tank weapons as it was an old 1931 design. The Spanish Civil War showed some of these defects in the T-26, but it wasn't until the Winter War against Finland that proved that the majority of light anti-tank weapons could destroy the T-26. In order to remedy this, Factory No. 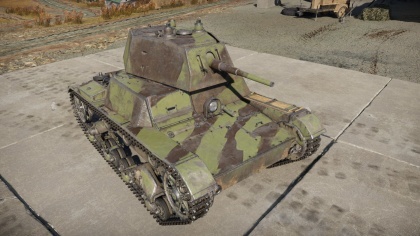 174 in Leningrad designed a new variant for the T-26 utilizing applique armour on the hull and turret. This variant was dubbed the T-26E (E for ekranirovanny or "screened"), which added 30-40 mm of armour to the original armour plates via bolting and welding. 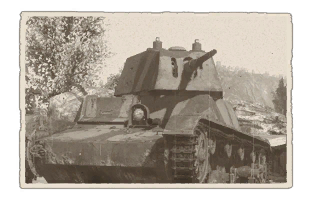 All of the single-turreted T-26 models made during the Winter War period was given this modification and testings proved that the additional armour made the T-26 much more resilient against light anti-tank weapons. A total of 89 T-26Es were made during and after the Winter War, with 27 single-turret models made from the factory, 27 more as flamethrower-models, and 15 single-turret models were made in workshops near the front-line. After the war, 20 more single-turret variants were made and delivered for tank units. Many more modified T-26s were made during the course of World War II. These T-26Es were used in the Winter War against Finland and the extra armour over the normal T-26 variants made it impenetrable to Finnish light anti-tank weapons. However, the extra armour added to the T-26 raised the weight from 9.6 tons to 12 tons, thus a larger strain on the chassis, engine, and suspension so the driver were advised to drive the tank in low gear and must take extra care to not overload these systems. During World War II, applique armour of varying thickness from 15–40 mm were added onto many different T-26s in large quantities ranging to hundreds in the front-lines to fight back the German invasion. Such areas where these modifications took place in Leningrad, Odessa, Moscow, and Sevastopol in the period of 1941–1942 during battles and sieges taking place in or near these cities. However, compared to the modifications made during the Winter War, the World War II T-26Es were more crude and rough that the gun mask on the tank were unable to move, and the applique armour was only added on the front. No known combat records exist for these modified T-26s in World War II and may have been simply be added as performances done by regular T-26s, but due to the obsolesce of the T-26 models compared to the German Panzer III and Panzer IV, many can be presumed to be lost in combat if not due to mechanical failures.